Six Sigma certification validates your level of training and proves that you have the required level of knowledge to pass the exam. 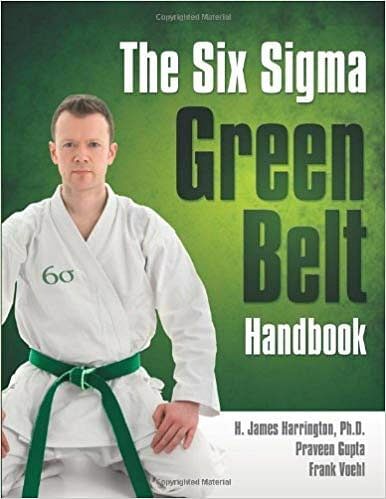 Six Sigma uses martial arts terms to describe the two main levels of certification: the Six Sigma Green Belt (CSSGB) and Six Sigma Black Belt (CSSBB). There are dozens of books that can help you understand Six Sigma, learn the techniques in-depth and prepare you for the certification exam. 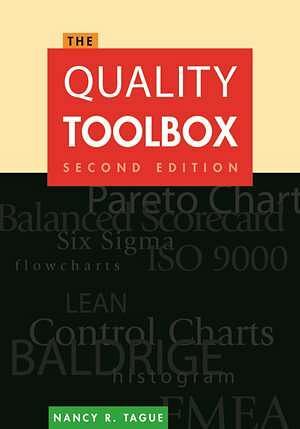 The books listed here will complement your Six Sigma training and serve as reference guides. Which book to choose depends on your specific needs, your current level of knowledge and the course material you possess from your training classes. 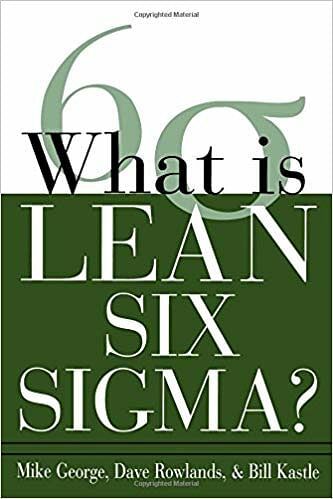 Published by the American Society for Quality (ASQ), this book is, as the name claims, a handbook, containing explanations of all Six Sigma areas at the Green Belt level. It included terms, processes, acronyms, and reference material. The book follows ASQ's Body of Knowledge for the Green Belt Certification and comes with two CDs which contain mock-exams, a video course, and helpful additional material. This book provides an overview of Six Sigma, and it can be used as a reference guide to answer questions that may arise during your studies for the test. However, it is intended to be a handbook and is not a training manual for the exam. When ordering, be sure to get the latest edition as its content is continuously updated to match the ASQ Body of Knowledge (BoK) for the Certified Six Sigma Green Belt, which is updated on a regular basis. 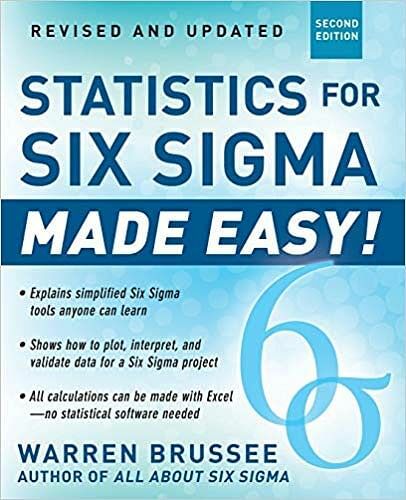 Brussee’s book focuses on the statistical methodology and the techniques used in Six Sigma, explaining them in an accurate and easy to understand language. All of the basic Six Sigma formula and tables including the DMAIC improvement cycle are explained and illustrated with real-world examples. 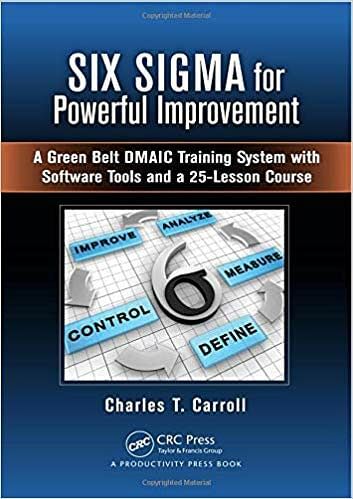 The book contains basic Green Belt training and a matrix for finding the right statistical tool to use in a Six Sigma environment. Statistics are an important part of Six Sigma, and an understanding of statistics and the ability to use them correctly are needed in order to pass the exam. Practitioners will be expected to collect data from all areas of a business and apply statistics to create various matrices, graphs, and charts. This book details the most common Six Sigma tools together with the basic Six Sigma formulas and tables. It offers simplified, actionable ways to look at processes and data. In this book, Keller explains all the main aspects, techniques, and methods of Six Sigma in clear, concise terms. His book aims to help you to develop your skills in Six Sigma by providing advice on how to build the Six Sigma infrastructure and use the DMAIC methodology in your projects. Six Sigma DeMYSTiFieD provides a complete blueprint for developing strategies, plotting growth, and performing at peak efficiency for maximum profits. You’ll find clear advice on when and how to use specific problem-solving tools. Though the book does not claim to be a training manual for the Green Belt certification, it comes with quizzes and even a final exam at the end, thus greatly aiding the candidate in their preparation for the examination. 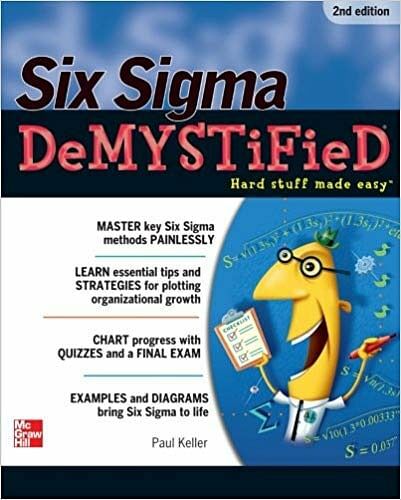 Besides explaining Six Sigma roles, responsibilities, techniques, and methodology this guide focuses on the question ‘what can Six Sigma do and achieve?’, and ‘how is Six Sigma executed?’ The main goals of the book are to convey an understanding and mastery of all of the five DMAIC phases and the handling of foundational Six Sigma statistics. Additionally, it has special chapters on pursuing the Six Sigma Black Belt and Green Belt certifications. With 16 chapters and over 430 pages, this guide will be an invaluable resource for everyone who plans to become involved in Six Sigma. 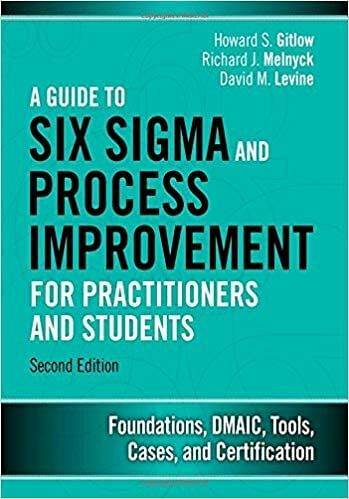 This book is not a training manual for the exam, but is recommended to gain an understanding of what Six Sigma Process Improvement actually means, and how it's done. It uses an extensive set of examples from the healthcare industry. Carroll focuses on the Six Sigma's DMAIC (Define-Measure-Analyze-Improve-Control) methodology. Familiarity with this methodology is important for anyone planning to work with Six Sigma. Although the tools and techniques presented are specifically associated with the DMAIC philosophy, they are applicable across a wide number of scenarios. This book is not focused on helping you pass the exam. It aims at a comprehensive understanding of Six Sigma and knowledge of the wider context in which it is deployed. The 25 lessons occupy over 450 pages and provide a thorough grounding in all phases of a project, from definition and analysis to measurement, improvement, and control. The book includes a CD with a PowerPoint-based DMAIC training course. This is, as the title states, a toolbox. It is not so much a book to be read from cover to cover, rather it is a collection of tools that can be used for analyzing data and information. It is a comprehensive reference to a variety of methods and techniques used for quality improvement. The reader will find explanations of a number of widely used quality control tools (for example, the fishbone diagram, the Pareto chart) as well as the newer management and planning tools. Tools for generating and organizing ideas, evaluating ideas, analyzing processes, determining root causes, planning, and basic data-handling and statistics are included. This is neither a textbook nor a training course but is a good choice to read in preparation for a certification exam. Lean Six Sigma is a combination of Six Sigma and Lean principles. It combines the two most important improvement trends of our time: making work better (using Six Sigma) and making work faster (using Lean principles). In this plain-English guide, you’ll discover how this remarkable quality improvement method can give you the tools to identify and eliminate waste and quality problems in your own work area. At 96 pages, this affords you a quick and brief insight into what Lean Six Sigma is. It is a basic primer for all employees on using Lean Six Sigma to meet your company's goals and your customers' needs. While reading the book will not directly aid you in your exam prep, it will help you to see the big picture of where Six Sigma can help a business succeed. 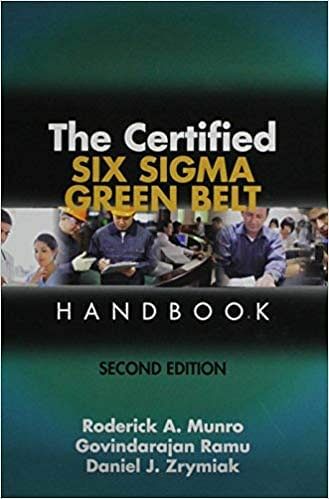 The Six Sigma Green Belt Handbook is a comprehensive, practical guide to becoming a Six Sigma Green Belt. It also has a chapter on Black Belt tools. Green Belt Students will benefit from the Green Belt Basic Skills and Tools sections; while more experienced readers can learn how to successfully lead Six Sigma teams and how Green and Black belts can work together. The chapter on building teams is worth the price of the book! Details on Six Sigma software explain how to use macros and templates and provide exercises to guide students through these processes. This well-designed handbook contains a wealth of information. Whether preparing to take the exam or as a general Six Sigma reference guide, this book is an excellent choice for candidates. None of these books is a one-stop preparation resource for the Six Sigma exam. Learning the Six Sigma methodology takes more than rote memorization of test questions from mock exams. One needs to possess a thorough understanding of the methodology involved, after which passing the exam should be a walk in the park. These books will help you understand the many aspects of the Six Sigma methodology. We recommend you choose those which are appropriate for your level of knowledge and needs and will complement other training resources.